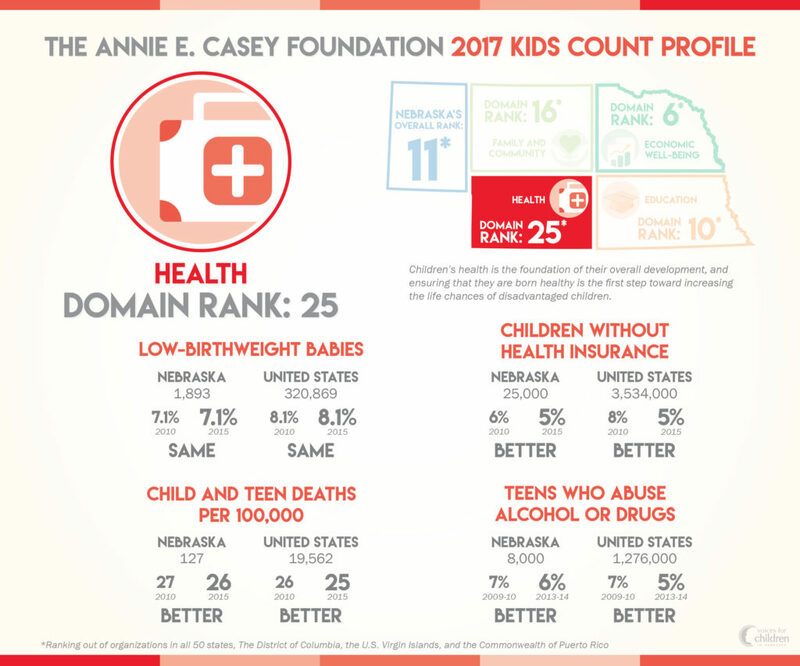 Last month, the Annie E. Casey Foundation released the 2017 KIDS COUNT Data Book, providing an annual snapshot of how America’s children and families are faring in every state and across the nation. In it, Nebraska received an 11th place ranking in overall child well-being. Over the past few weeks, we have been investigating the Data Book and how Nebraska kids are faring in each domain. So far, we have examined the Economic Well-being of Nebraska kids and Nebraska kids Educational Well-being. Today we will take a look at our lowest scoring domain – Health. Children’s health is the foundation of their overall development, and ensuring that they are born healthy is the first step toward increasing the life chances of disadvantaged children. Poverty, poor nutrition, inadequate housing, lack of preventive health care, substance abuse, maternal depression and family violence put children’s health at risk. Poor health in childhood affects other critical aspects of a child’s life, such as school readiness and attendance, and can have lasting consequences on his or her future health and well-being. Nebraska ranks in the middle of all states when considering the four health indicators with a 25th place ranking. Nebraska remained the same or saw improvements in all four indicators in this domain and showed similar trends to the nation as a whole. Low-birthweight babies: 7.1% (1,893 babies) in 2015 – Babies born with a low birthweight (less than 5.5 pounds) have a high probability of experiencing developmental problems and short- and long-term disabilities. They are also at a greater risk of dying within the first year of life. Smoking, poor nutrition, poverty, stress, infections, obesity, multiple births, and violence can increase the risk of a baby being born with a low birthweight. Compared with other affluent countries, the United States has among the highest percentage of babies born with a low birthweight. workers lack employer coverage, public health insurance has resulted in increased coverage among children during the past decade. Having health insurance can protect families from financial devastation when a child experiences a serious or chronic illness and can help children remain healthy, active and in school. Child and teen deaths: 26 per 100,000 children (127 death) in 2015 – The child and teen death rate (deaths per 100,000 children ages 1 to 19) reflects a broad array of factors: physical and mental health; access to health care; community factors (such as violence and environmental toxins); use of safety practices; and, especially for younger children, the level of adult supervision. Accidents, primarily those involving motor vehicles, were the leading cause of death for children and youth, accounting for 29 percent of all deaths among children ages 1 to 14. As children move into their mid- and late-teenage years, they encounter new risks that can be deadly. In 2015, accidents, homicides, and suicides accounted for 74 percent of deaths to teens ages 15 to 19. Teens who abuse alcohol or drugs: 6% (8,000 teens) in 2013/14 school year – Abuse of alcohol and drugs can negatively impact cognitive growth of the teenage brain during a critical time of development. Teens who abuse these substances are more likely to engage in risky sexual activity, drive under the influence, abuse multiple substances and commit crimes. Abuse of alcohol and drugs is also linked to physical and mental health problems, poor academic performance and disengagement from peers, family, schools and community. The negative consequences of teen alcohol and drug abuse can carry over into adulthood. Overall, alcohol and drug use by adolescents have declined during the past decade, although patterns vary by substance.